Business intelligence (BI), analytics, and data visualization software is becoming a key component of any organization looking to take more data-driven actions. The acquisition of a BI tool that allows for full control, visual exploration, preparation and transformation of data so that organizations can deliver it in the most actionable way is highly coveted. But companies aren’t just clamoring for a BI solution for internal purposes; they’re looking to differentiate their own applications with beautiful analytics to better serve their external customers. Whether it’s to enhance their client’s web portals with better reporting, integrate dashboards into their on-premises and SaaS offerings, or build an entirely new data application from scratch, they are asking for a BI and analytics solution to be embedded within their business applications. Embedded analytics, also known as embedded BI, by definition, is the integration of self-service BI tools into commonly used business applications. In other words, your application – be it a reporting solution, cloud solution, Internet of Things solution, etc. – gets all the good stuff associated with a BI application; interactive reporting, dashboards, visual analysis and more. When done well, all these added features will look and work just like your existing business applications, leading to increased adoption rates amongst your customers, as they are already comfortable with your tool. Why is the desire to add embeddable analytics software to a single/suite of existing applications so great? The answer is simple: External customers will experience a more consistent user experience when using your business application, as a result of consolidating BI capabilities, and ultimately removing the need for multiple tools. An embedded analytics solution that integrates seamlessly into your existing applications, while maintaining the same look and feel as those applications, will provide your customers with an extremely consistent experience. Rather than introduce users to a new, foreign tool, and have them alternate between separate platforms to obtain insights, embedding an analytics solution instantly simplifies their experience while reducing the amount of training required. An embedded analytics solution eliminates the need for users to have multiple tools to prepare, analyze and visualize their data, which results in faster, deeper insights. Once you’ve decided you want to enhance your application with analytics, the second question to ask yourself, is whether to embed, or build your own. In this case, the tradeoff is mostly between licenses costs and development costs and the ability to develop similar BI and analytics capabilities with your in-house development team, vs. what a vendor focused on BI and analytics can develop. Even if your team can build that – how long will it take them? Do you want to be in the business of BI and analytics, or do you want to stay focused on your original business? Unfortunately on the surface, the differences between embedded analytics solutions can be difficult to distinguish. That, coupled with the fact that many BI software vendors claim their product can be embedded, but actually have very limited capabilities designed for it, make the search for an exceptional solution that much harder. What shouldn’t be difficult however, is getting information on how to select the right one. 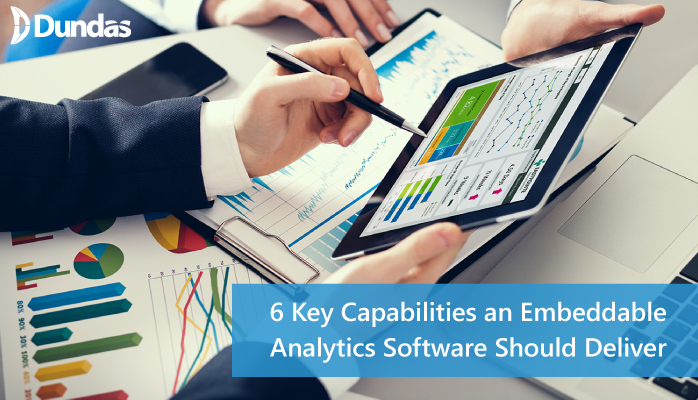 To help with your search, we’ve identified 6 key capabilities an embeddable analytics software should deliver in order to provide the most value within your application(s) and to your customers who will ultimately be using its functionalities. The first, and arguably most important capability an embeddable analytics software must possess, is the ability to deliver analytics quickly. A solution with massive out-of-the-box capabilities, combined with a modern and agile platform will bolster any business application and perform quicker time-to-market delivery. Throw in smart defaults and automatic data prep, and what do you get? Fewer steps from raw data to end products, which means your external customers get their desired solution faster. The ideal embedded analytics solution must be able to scale with ease. It should be designed to support large scale solutions with built-in multi-tenant management, usage monitoring and unlimited users licensing. This means that no matter who your customers are or how many you have, you’ll have the capacity to service them, without having to invest in complex maintenance processes or keep worrying about unpredictable billing from your analytics software vendor. Embed an analytics solution that goes beyond canned reports and dashboards and allows for full self-service, ad-hoc reporting and mashup capabilities. Make sure you don’t embed a tool that requires a separate desktop application to perform self-service analytics as that will defeat the purpose of consolidating your analytics into one offering. Empower your customers with a tool that allows them to personalize their reports and create relevant and actionable content that is easy to consume, with minimal assistance from you. Your customers will love their independence and you will love the extra time you get back to focus on other initiatives. Your client-facing reporting and analytics should be held to the same standards as your internal BI. If your customers can access it, it needs to be stunning. It also needs to be empowering. Ensure that the analytics solution you are embedding can provide cutting-edge interactive visualizations using an experience tailored to your specific customers’ skills and needs. Enrich your customers’ experience by allowing them to view, create, interact with, monitor and share key business metrics, the way they want to. Adoption rates will be much higher when users are able to interact with the tool in a way that makes sense to them. Another top capability embedded analytics solutions must contain, is the capacity to stay in control. This goes beyond the ability to white-label obvious elements of the embeddable analytics software. This means the software should give you the option to go beyond its existing functionality and deliver to your external customers’ exact requirements without being dependent on the software vendor. Don’t settle for out-of-the-box functionality. Search for an embedded analytics solution that provides rich, open APIs so your developers can customize and extend the platform to fit your solution specific needs. Don’t consider just the embeddable analytics software features and hope that it works the way you need it to. Partner with an organization that goes beyond providing licenses, and focuses on enabling your success. Remember, the journey to a successful solution extends beyond the software alone and requires great support and agility from your vendor, as the solution expectations are harder to manage being external to your organization. When considering any solution, I recommend asking for a personal, live demo of the capabilities so you can assess which solution will work best in your particular situation. If a vendor claims they can provide embedded analytics capabilities, they will be eager to show them off to you. Is Big Data Security Still Lacking?